Calendars can be an integral part of our lives if we want to be productive and timely. Nowadays, smartphones include great calendar apps which can be customized and synchronized to the same set of features, data and information throughout any device. Talking specifically about Android, we get quite a lot of features from the built-in calendar app like setting reminders, birthdays, events manually and checking the date etc. A more realistic approach to using a calendar should be to take your productivity to next level. Reminding about your daily meetings, events, public holidays and birthdays (all-in-one) is the first priority set in your calendar app. File sharing, direct interaction with the events, and importing data through the Internet are some of the features of a good calendar. If you think your built-in Android calendar misses one of these features, you should switch to one of the more advanced calendar apps discussed below. The interface of Jorte Calendar App is pretty similar to those paper organizers and this is what the developers have tried to do. Appearance is really good and user interface is very user-friendly. The application is best suited for both business and personal purposes. You can also add custom widgets to the application. This actually works as your personal schedule assistant but it can also be used as a calendar app. Talking about its features, you can whether get the dates viewed on weekly or on monthly basis. You can rotate its displays sideways. Colors for important days and backgrounds can also be customized in this simple yet smart application. Another great thing that I liked in this application is that it syncs your own tasks with Google Tasks. You can even import and export such type of data. When you enter a place, it automatically displays Google Maps. The application supports Google Voice Search also. MyCalendar is a reminder-type application that sets notifications and lets you know so you don’t miss your friend’s birthday or an important event. The application is specifically for birthdays when it comes to extracting data, however, you can use it as a regular calendar. You just have to select your friends and MyCalendar will do the rest. 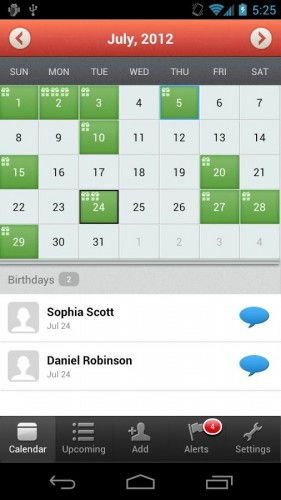 It will match your friends from contact list with Facebook and will set a birthday calendar for you. The application is suitable for those people who don’t bother remembering their friend’s birthdays. You can also add custom birthdays to your calendar. The app keeps an option of custom messages so you don’t have to go to write message and type a long message for your friend. Just select one of the many custom messages and wish your friend in just one tap. Gemini Calendar has an innovative data entry method. It is not as user-friendly as Jorte calendar but still it’s a good one. It also supports Google Voice search. Point-to-see method is the most amazing thing in this application. Unlike MyCalendar, the application syncs all events from your address book and history log and creates a full-fledged calendar for you. 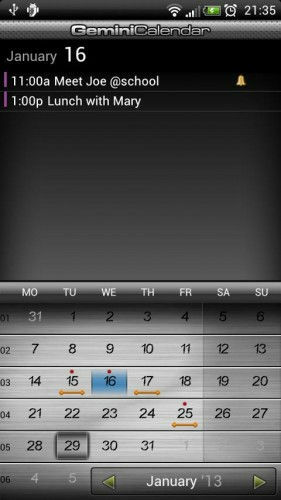 Widgets can also be added as in Jorte Calendar. Talking about the interface, the application provides two types of skins; light and dark. Easy swipe option for months is really great. Above all, the Gemini Calendar is available in several languages. The smart calendar has a very clean-looking interface. The app is best for every member of the family as it keeps track of important family events and schedules a calendar for you. Other available options are shopping lists and to-do lists. The application is totally free but they offer ads in this free version. If you can’t stand these ads, then you can upgrade your account to Cozi Gold for $29.99 a year. Just like Gemini, you can sync your data with Google Calender. The calendar application shows weekly view of your events mainly. However, you can switch to daily and monthly view through easy swipe. The exciting thing about this application is its tiles for weekly view. Like other apps, it offers widget support. The app is fully customizable. You can set up to 48 colors for tiles and manage different font sizes. Interface looks very cool with zodiac signs for every horoscope. 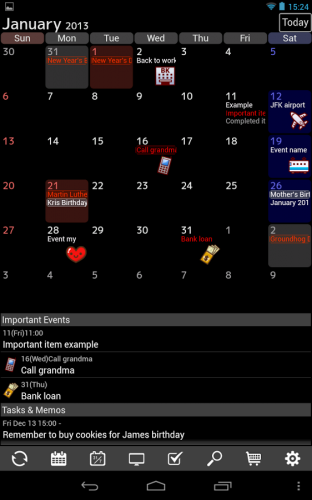 Among all the above explained calendar apps, Jorte Calendar App is the best; not because it is on No.1 but it has all the features a calendar application must have. 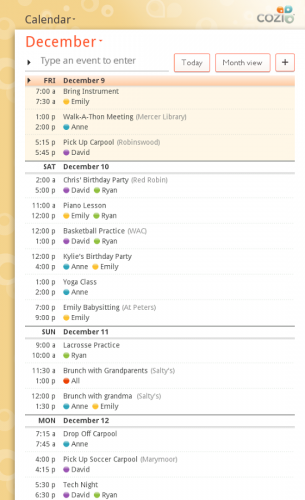 Like Cozi family calendar and aCalendar do not sync with Google Calendar. MyCalendar only supports birthdays while Gemini Calendar’s interface isn’t that appealing. It is more for personal use and less for business. Do you use calendars for productivity? Which is your favorite calendar app on Android and why? I don’t use an Android phone but whatever I’m using, I want to use a calendar which is available across platforms and devices. So if I update my calendar on a mobile phone, I should get the updates instantly in my computer. Since Android is from Google, the default calendar app should be tightly integrated with Google Calendar. We can integrate Google Calendar with Outlook on the PC. If this is the case, I will definitely prefer to use the default calendar app. Jorte calendar also seems to have a good feature set.